Loudonville, NY – For the sixth time since its inception in 1982, the Siena College Research Institute’s (SCRI) Survey of U.S. Presidents finds that experts rank Franklin D. Roosevelt, Teddy Roosevelt, Abe Lincoln, Thomas Jefferson and George Washington as the United States’ top five chief executives. The 157 participating presidential scholars for the first time name Washington as number one with FDR second, Lincoln third, Teddy Roosevelt fourth and Jefferson fifth. Donald Trump enters the survey as the 42nd rated president, and he joins Andrew Johnson, James Buchanan, Warren Harding and Franklin Pierce in the bottom five. Dwight Eisenhower moved up to sixth, the highest ranking he has ever achieved, while Ronald Reagan was up five spots to 13th, and George W. Bush was up six places but remains in 33rd place. Barack Obama slipped two spots to 17th, Bill Clinton dropped to 15th from 13th, and Andrew Jackson fell five places to 19th. “The top five, Mount Rushmore plus FDR, is carved in granite with presidential historians who have ranked the presidents for Siena six times since 1982 always just after a new president has had one year in office. But five through ten has seen some jockeying for position over the last 37 years. Eisenhower wasn’t even in the top ten in ’82 or ’90, but after one eighth place and two times at tenth, Ike has jumped to the sixth spot just out of the vaunted top five. And JFK has rejoined the top ten after two misses while Woodrow Wilson has dropped from eighth to 11th ” according to Don Levy, SCRI’s director. “While other ‘moderns’ are highly rated, including Truman at ninth this year and six straight times in the top ten and Kennedy, tenth this year and back in the top ten after narrowly missing in the last two surveys, no president that has served since Kennedy is considered one of our ten best,” according to Doug Lonnstrom, SCRI’s founding director and one of the survey’s originators. “The serving president has entered the survey between 15th , Obama, and 23rd , G.W. Bush, as scholars begin to observe their accomplishments, assess their abilities and study their attributes. This year, Donald Trump enters the survey at 42nd , and he is only ranked outside of the bottom five in two of the twenty categories that scholars use to assess the presidents, ‘luck’ and ‘willingness to take risks,’” said Levy. Scholars rate presidents on each of twenty categories that include attributes – background, imagination, integrity, intelligence, luck and willingness to take risks, abilities – compromising, executive ability, leadership, communication, and overall ability and accomplishments – party leadership, relationship with Congress, court appointments, handling the economy, executive appointments, domestic accomplishments, foreign policy accomplishments and avoiding mistakes. Theodore Roosevelt is rated highest on attributes, Lincoln tops the list on abilities and Washington leads on accomplishments. Scholars were asked which of all the presidents they wish could be in office today to address each of seven current issues. Obama was selected three times for addressing health care in the U.S., ensuring that American values are afforded to all Americans regardless of their race, ethnicity or socio-economic position and, tied with FDR, for developing a shared vision of America’s role in the next century. Eisenhower was the top pick for resolving the crisis with North Korea and combatting the threat of global terrorism. Bill Clinton was the choice for promoting sustainable growth in the American economy and Washington was top rated on enhancing trust in the federal government. The survey also added a series of questions that asked scholars to say whether the presidents of the last fifty years – Richard Nixon (ranked 29th), Gerald Ford (27th), Jimmy Carter (26th), Reagan, George.H.W. Bush (21st), Bill Clinton (15th), G.W. Bush, Obama and Trump will ultimately be judged by history as moving the country in the right direction or on the wrong track on foreign affairs, the domestic economy, human rights, and the quality of our democracy. Both Clinton and Obama were seen by respondents as strongly moving the country on the right track on all four. Ford, Carter and G.H.W. Bush moved the country on the right track on each except the domestic economy. Reagan moved the country on the right track on two of four – foreign affairs and the quality of our democracy while Nixon moved the country forward on only foreign affairs. Historians say that neither G.W. Bush nor Trump moved the country on the right track on any of the four aspects of leading the country. “The perfect president? Scholars agree that Washington today is ranked first and encourages trust in the federal government. FDR is close, ranked second and remembered for his first year. Lincoln may have had the greatest skills, Teddy Roosevelt, the right stuff, and Eisenhower today is the leader many would like addressing international trouble spots. Jefferson, Madison, Monroe remain profoundly respected and among the moderns, Reagan, Clinton and Obama are highly regarded. While Trump has entered the rankings near the bottom, despite his initial low scores, it is early in his presidency and history not these historians will determine his ultimate place among American presidents,” said Levy. 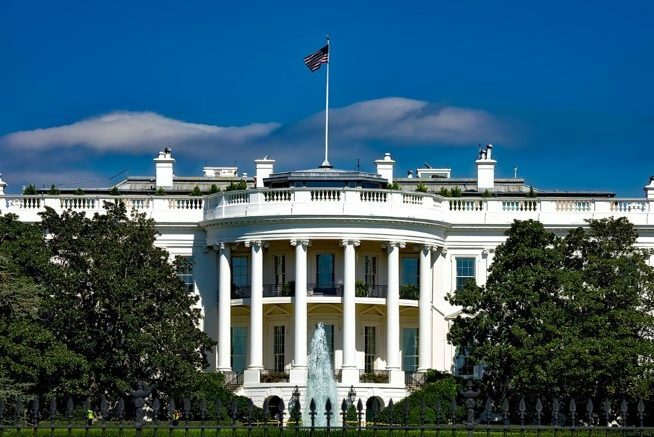 The Siena College Research Institute (SCRI) Survey of U.S. Presidents is based on responses from 157 presidential scholars, historians and political scientists that responded via mail or web to an invitation to participate. 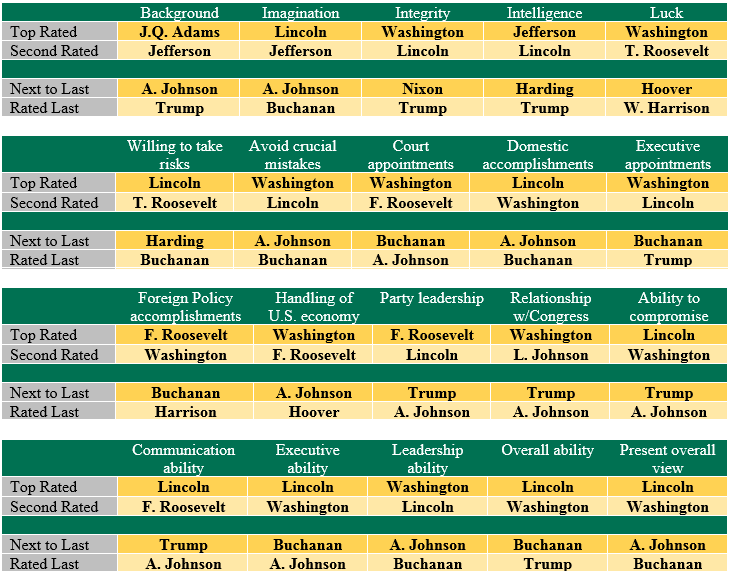 Respondents ranked each of 44 presidents on a scale of 1 (poor) to 5 (excellent) on each of twenty presidential attributes, abilities and accomplishments. Overall rankings were computed by assigning equal weight to each of those twenty categories. For additional information about the survey visit www.siena.edu/sri/research or contact Don Levy at 518-783-2901, dlevy@siena.edu or Doug Lonnstrom at 518-783-2362. * Grover Cleveland was the 22nd and the 24th president. As such there are 44 unique individuals who have held the U.S. Presidency.